German Chancellor Merkel Fractures Hip In Skiing Accident : The Two-Way Angela Merkel suffered the injury while cross-country skiing in the Swiss Alps. She didn't realize she had a fractured hip until she returned to Berlin. 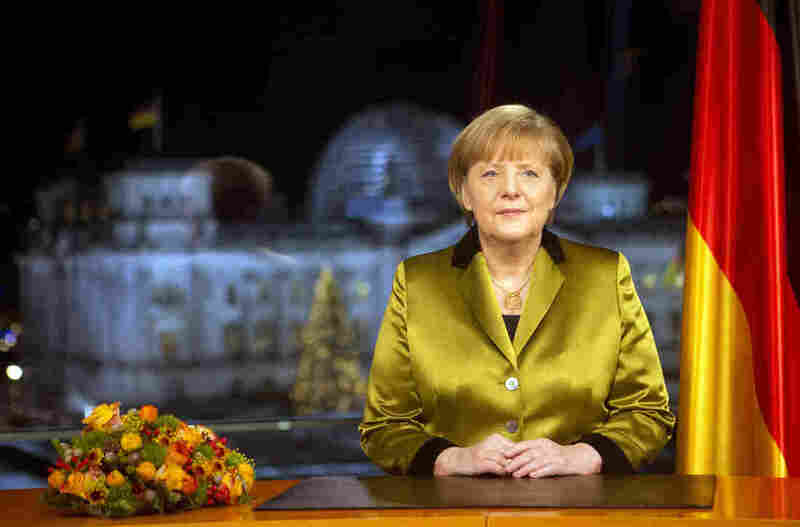 German Chancellor Angela Merkel after the recording of her annual New Year's speech at the Chancellery in Berlin, Germany, on Dec. 30. German Chancellor Angela Merkel fractured a hip during a cross-country skiing accident in the Swiss Alps, her spokesman, Steffen Seibert, said on Monday. He says the injury will confine the German leader to a bed for about three weeks, so Merkel has cancelled some meetings. "Seibert told reporters that the accident occurred at low speeds. He says Merkel at first thought she'd only bruised the left side of her lower back. But doctors say she suffered an 'incomplete' bone fracture that requires bed rest. "As a result, the chancellor canceled a planned visit to Warsaw on Wednesday. And the Luxembourg prime minister called off his trip to Berlin on Thursday. "Seibert says Merkel will still preside over government and cabinet meetings. The German parliament reconvenes next week." USA Today reports that Merkel suffered the injury during the Christmas break, but it wasn't until she got back to Berlin that her doctors told her she had a broken hip that will need bed rest to heal. The paper adds: "Fellow German and Formula One legend Michael Schumacher remains in a medically-induced coma for a severe brain trauma suffered while skiing in the French Alps over a week ago."